I’m not sure I’ve ever made a New Year resolution before, or at least, not for as long as I can remember. I mean, what’s the point? It’s not like anyone ACTUALLY keeps them, and who wants to set themselves up for failure anyway? Ok, so I’m definitely failing on points 3 and 4, but I figure if I have to fail on any, they’re probably the ones to pick. Now I know my Mum and Dad will be reading this so I’d just like to say for the record, I only smoke a little bit when I drink..I’M SORRY! But it’s gone, over, finito. And instead, I’m going to distract myself by blogging, which, I let fall by the wayside due to a new, insanely busy job. To ease myself back in I thought I’d start with a nice and easy recipe. 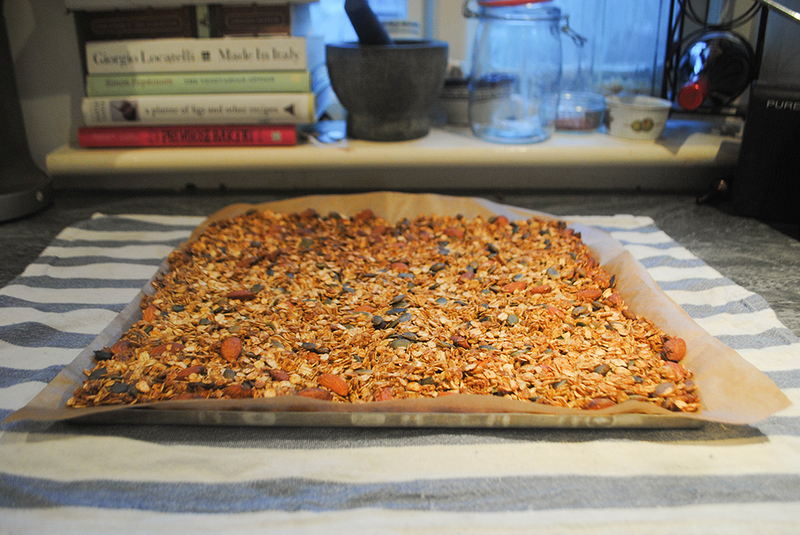 I’m not even sure why I ever made granola for the first time – as my friend Sinead once said, ‘who the f@$k makes granola anyway?’. I think it was because, as far as cereals go, it’s insanely expensive. I mean, some of the organic varieties are pushing £5 for a small packet. 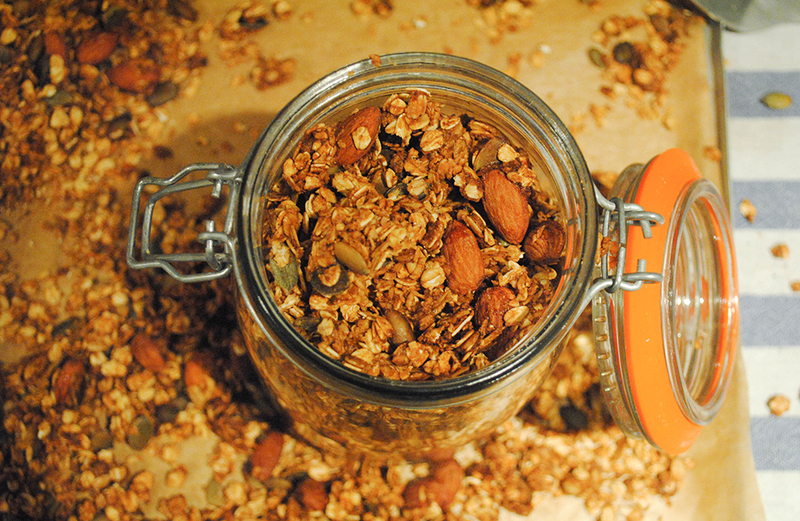 Granola is cheap and easy to make. It keeps for ages in an airtight container and generally stops me tucking into a plate of bacon on weekends. It’s really versatile and you can eat it with whatever seeds, nuts and fruit take your fancy. Plus it’s a not-too-bad-for-you snack when you get a sugar craving. Pre-heat the oven to 170°c/335 F/gas mark 3. 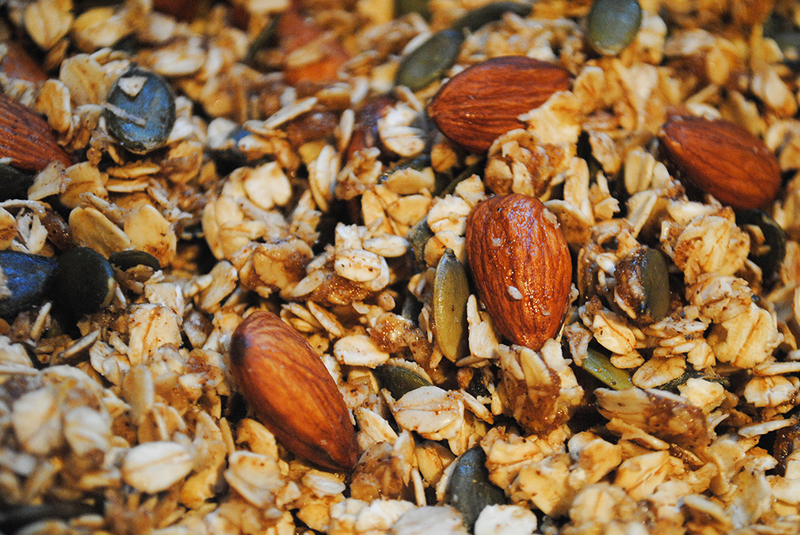 Mix the pumpkin seeds, almonds, ground cinnamon, ginger and sugar into the oats until evenly distributed. Next add the sunflower oil and mix well. Now add the honey – it may clump so make sure you mix it in well, otherwise you’ll get overly sweet, hard clumps once it’s cooked. 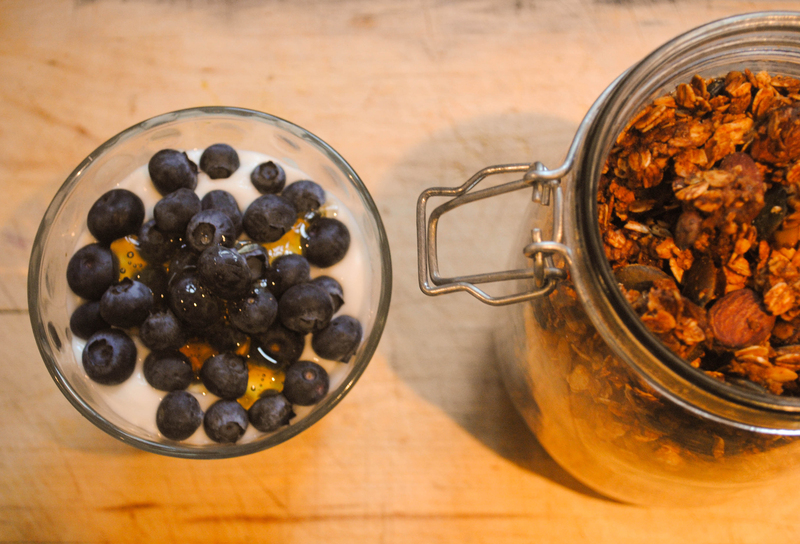 The last time I made granola I added too much honey in a bid to get it to clump. It came out WAY too sweet so I have since discovered a much better substitute – beaten egg white – the protein causes the oats to bind together really well. If you prefer your granola loose, you can leave the egg out. Spread evenly across a baking tray lined with greaseproof paper. Bake for 35-40 minutes or until golden brown. NB I took mine out after 20 minutes and allowed it to cool before breaking up the edges and turning over the middle bit which cooked more slowly. I then put it back in the oven for another 20 minutes. Take out of the oven and leave to cool. Break into pieces and add raisins, chopped dates or dried apricots. 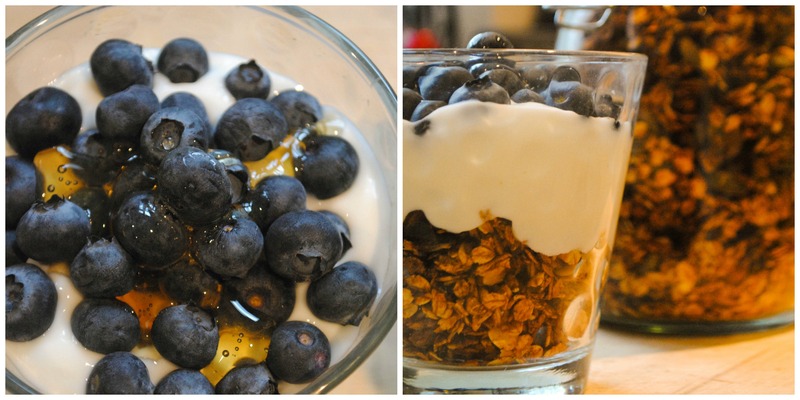 Serve with milk or yoghurt, honey and fruit.